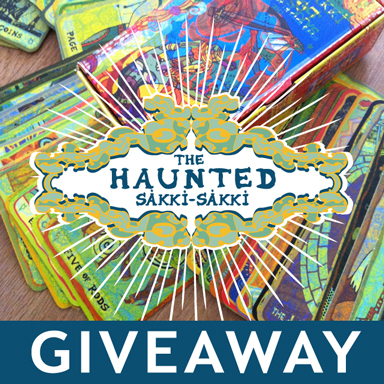 So what is The Haunted Sakki-Sakki Tarot? But it does include the first printed cards of the first and only original run. So much the first, that they were all trashed, as the back side was printed on both sides to “warm up” the machine and to get some paper rolling. Every run of print has such an amount of “damaged” material. They sometimes call them “makletours”. Well, these were just too pretty to let them be trashed. In a way, there were even more beautiful. Unexpected things happened. New shapes emerged, other shapes covered. A new form of art was born with the random and the mistake in mind. Not caring about mistakes, that is. The greenish looking layer gave the feeling of a haunted lace. Making things even more mysterious than they already are. The cards speak a bit more spooky too. I collected some cards and savored them. Then compiled them carefully into a few decks. I gave two or three as special gifts. The rest I kept. Till now. Two I will keep for my kids. One for myself. Each deck is different. Some cards are very greeny, overprinted and laced, others less. Each deck has a character, things it hides and things it reveals. This deck is a magical mistake.